A state-of-the-art raised dog washing tub. Ramp to help your dog get in and out of the tub safely. Apron to keep you dry. Customer assistants to lend you hand and clean up when you are done! Crates for multiple dog households. 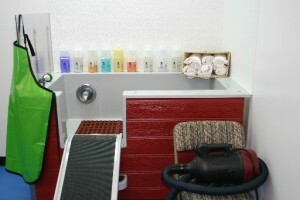 *We provide Earthbath, Bio-Groom and TropiClean shampoos for use in our dog wash. The same products our groomers use! *We have a special De-Shed Solution that can be purchased for an additional $5.00 (12oz of De-shedding Shampoo and 12oz of De-shedding Conditioner). The dog wash is available first-come, first-serve. *Payment made by cash or check will receive a 1% discount.